We live on a lake. Our land is split into two parcels, one narrow and adjacent to the lake, and the other, across the road from the lake, on which our house sits. This is slightly inconvenient, having to cross the road in order to access the lake, but we've become accustomed to it. However, the narrow portion is only about ten feet wide. This would not be so much of a problem, except for erosion, which seems to make it narrower every year. Actually, after a spate of erosion about a decade ago, it seemed to be in a fairly steady-state situation, because the lake, whose level is controlled, was kept at a low level, and the ice, which causes most of the erosion (we're not sure if it's thermal expansion of the ice, or having a mile wide sheet of ice slammed into the bank), battered harmlessly against the lake bottom. 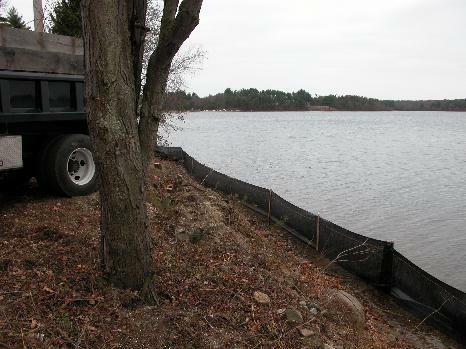 However, a couple of years ago, the lake management committee and conservation commission had a change of policy, and began to leave the wintertime lake level high. In 2002, the first recent such year, we lost about 2 feet of land, as the soil became shoved back. 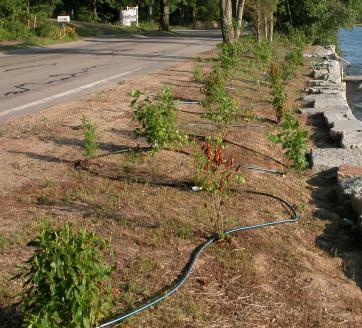 In addition to making our lake access more difficult by making it more clifflike, it also softened some of this soil and rain eroded it down into the lake. 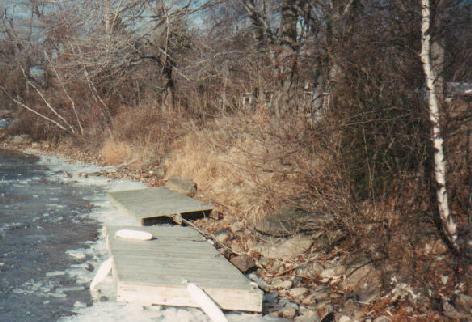 In late fall of 2003, I called the town and encouraged them to reduce the lake level in order to avoid similar erosion that winter. We had done this in a prior year, when my call was greeted with "of course we will lower the lake level". This year, however, I was greeted with "we must keep the lake level high for aquifer recharge purposes". 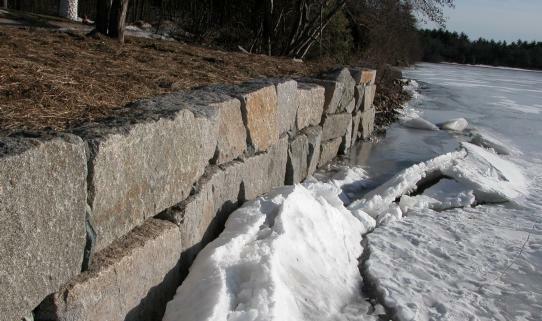 I complained bitterly about erosion, and was told that the conservation commission would be able to help us get a permit to build a wall to eliminate future erosion problems. This wasn't exactly what we had in mind, but we were willing to go for it. It being October or so, there wasn't much time between then and the time the ice would form, but the commission appeared confident we would succeed. How wrong they were! They recommended an engineer, and we hired him. First thing he wanted was a land survey, so we called surveyors. Contractors are all alike. It takes them awhile to return your phone call, it takes them awhile to quote you a price, and then finally when you hire them it takes them awhile to come. We didn't have our survey until the first of December. We had a blizzard on December 6. No work that winter! More ice, more erosion. We didn't have construction drawings, however, so we weren't ready to hire a construction company. Remember, our engineer doesn't do construction, he just makes drawings. And the drawings that he made for the hearings were not sufficiently detailed for construction work. In the bizarre department, our engineer asked for the rest of his money, and when we said "what about the construction drawings? ", he said "give me my money first." We said "usually we pay half at the beginning [which we had], and then the rest upon completion." He made the bizarre claim that he hadn't contracted to give us construction drawings, but only permit drawings, but that he would "throw them in for free" after he was paid. This seemed highly unlikely. After a fight in which he both threatened to sue us and gave us a sob story about his sick mother so we would feel sorry for him, we eventually settled for giving him half of the remainder and he gave us "whatever he had prepared already", which was pretty darned little. OK, so now it's spring, and we have many months before winter. No problem! (You think. We have one-year-old twins, and they are still being quite a lot of work. We don't really have a lot of time to call construction companies.) We eventually get around to it in midsummer. Dozens of contractors come. These people return your calls: many thousands of dollars are involved. It takes most of an hour to show each of them the documents and the site and describe the job. We eventually get four bids and choose one of them. It's advancing in the year again, and even though we finally chose our contractor in September, he has to do a lot of design work that the engineer didn't do, arrange with a quarry for rocks, arrange for an excavator, deal with the town to schedule a police detail to direct traffic, and so forth. The police detail is itself a bit of a scam. There's a law in Massachusetts where in order to direct traffic, you can't just have some guy you pay $10/hour; instead you have to hire the local police at overtime rates. You don't have any control over it, and their schedule is pretty obnoxious: it's a four-hour minimum, and if you need them for five hours, it's another four-hour block you have to pay for. Then, even if it's a clear line of sight from one end of the job to the other, the Sergeant might just decide you need to pay for two cops. Then they spend their time chatting with each other, on your nickel. I guess it's less boring for them that way. We actually tried to get the town to provide the police detail for us, rather than having to pay, on the grounds that if we didn't build a wall now, in about a decade they'd be having to move the road, which would be quite a bit more expensive. But they didn't go for it, citing the potential for setting a precedent -- the board of selectmen didn't want to get involved in private projects at all, even though the town administrator agreed with the merits of the particular case. 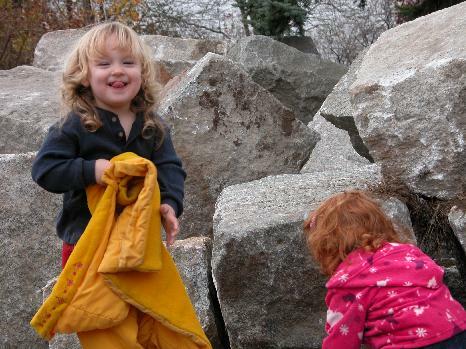 Finally, in early November, they get started, and giant rocks are dumped on our lawn. Many giant rocks! The kids loved climbing on them. 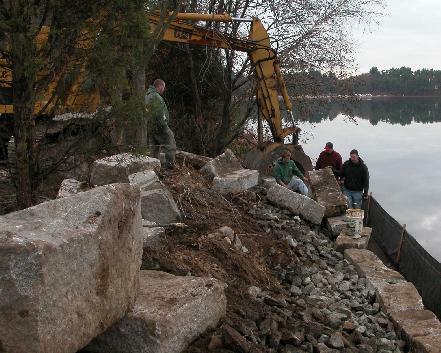 More prep work is to pretty much destroy everything already growing at the lakeshore, and make a barrier to prevent too much soil and other contaminants from getting into the lake during the construction. The conservation commission first told our contractor that he should not cut any vegetation he didn't absolutely need to, and then told him that it would be OK to clearcut, and then compromised with themselves and said that he could take out everything that was just a bush, but had to leave in anything that was a large tree. He leaves in four groups of trees. It looks horrible. I'm a tree hugger and even though it was various invasive species and ugly vines, all that destruction makes me sad. We have the first snowstorm of the year. All over our rocks; all over our lawn; all over the place they are supposed to do the work. We are starting to panic, because we have plans to go away for Thanksgiving. Fortunately, it's only about six inches, and it melts in a few days. However, the lawn gets saturated, and giant trucks have to drive on it anyway. One such giant truck gets stuck. Sideways in our driveway. One set of wheels sinking into the lawn on one side; another set of wheels sinking into the lawn on the other side. Fortunately, Valerie went out on an errand in the morning before this happened, so one of our cars is trapped on the street side. Thus Ken can get to work. I decide it's warm enough to ride my motorcycle, even though it's November and it just snowed, because I can walk it around the front of the giant truck, so I can get to work. Valerie reports that it took several hours before they finally got an appropriate tow truck to drag the drive wheels back onto pavement and get the truck out of there. Needless to say, our lawn was never the same. Finally they actually set to work. They have 4x8 sheets of plywood that they lay out into the street, on which the giant excavator drives. 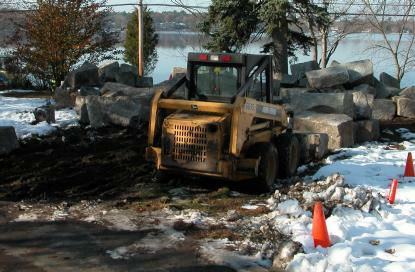 The town did not want the street ripped up by the treads of the excavator. Two small bobcats drive up and down our driveway each picking up a giant rock, and delivering it to the excavator. 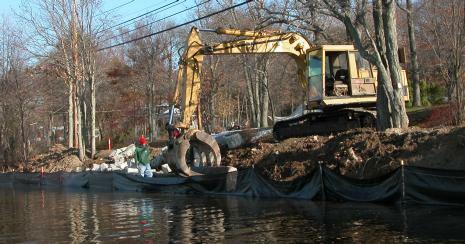 The excavator takes it up, rotates it away from the street out over the lake, and lowers it carefully into place. Each rock is between one and three feet in length, and a little more than a foot tall. 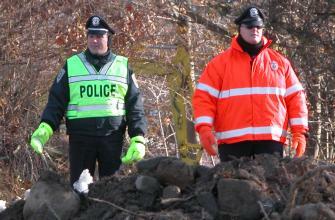 There are three layers of rocks, 170 feet of property line, for a total of about 250 rocks. That's a lot of rocks! It takes three days of excavator work, and then a couple of days of cleanup, pouring in loads of gravel behind the wall, dumping in some dirt on top. Well, it sure doesn't look natural! It's all wall! There are no two ways about it. You can see it from across the lake -- this big gray stone monstrosity. Whenever I look at it, I think, "who let them build that thing!? There are to be a law against that kind of thing." It's that tree hugger thing again. Winter comes. Ice freezes. More snow falls. "Take that!" I shout to the lake when it tries to batter down the wall. I feel powerful. But we're not done yet. Remember the requirement to replant. So we hire an expert on native wetlands vegetation to make a plan for which plants we should include. This guy seems to be pretty good and he gives us a list of shrubs and trees we should use. We deliver this list to our contractor, who seems to have suddenly turned into an incredible turkey, after giving us such good service in the fall. Months pass. We harass our contractor in March, and he says that he can't get prices from his nursery yet. Another month passes. Now he says he can get prices, but they can't get most of the plants we have been required to use, and he's making substitutions. Valerie gets a look at the list of substitutions, and says "He can't use this! This one's a horrible invader! This other one isn't native." Etc. So we go online and find a nursery in Amherst (a two-hour drive) which does stock all of the required plants, and we direct our contractor to try again. Another month passes. We call up, "what's going on?" It turns out that he sent a fax and they didn't return it, and so he just ignored the whole thing. We call the nursery ourselves. "We've been on vacation." Finally we get the nursery and the contractor together, and he claims to have ordered plants. Summer comes. This is not the right time to plant. We are fairly clueless about plants and how much water they require and things like that, so we ask when they finally come and plant, "how should we water them?" "Give them a drink once a day." We should have been more specific when we asked, because it wasn't enough. Plants begin to die. Finally someone with a clue (my mother) is visiting, and explains about deep watering. It takes over an hour a day to get these things all watered properly. There are 45 plants, and they really need a couple of drinks in a row. We do it ourselves for a couple days, and then pay the teenager next door for another few days. Then Ken spends several hours at the hardware store and down at the lakeside, and now we have a really cool irrigation system, using water from the lake itself. It's not feasible to do it from our water tap, because of having to do it across the road -- if you're hand watering it's mostly fine, but I wouldn't want to leave the hose stretched across the road unattended. (In fact, one hose sprang a leak after an encounter with a heavy truck. So I was right to worry.) Also the town has watering restrictions during the summer, so it's not legal to have an irrigation system. We're not sure if it's legal to have it using lakewater, but we're not asking. We get the power for the pump from our electric tractor, which we drive across the road when it's time to start watering, and then drive back for recharging afterwards. We do have a 25 ft. wide patch of lawn that they permitted us to install at our lake access point (stone steps down through the wall), but it also had a lot of trouble because we didn't water enough. Apparently you should water new grass twice a day, especially during a heat wave, and we only did it once a day. I even got a permit to water outside the watering restriction times for the new lawn, and it specified only one two-hour period per day, and so I assumed that's what you should do. But then later we learned the landscapers had expected us to water more than that. But they didn't tell us. They didn't even say when they were coming. We just came home one day and there was what appeared to be green spray paint all over our front yard (really, hydroseeding mix). This long complex journey is almost at an end. We need to have the wetlands expert come back every couple of years and see that the plants are still growing, and that we haven't replaced them with invaders or clear cut them and planted more grass. We hope the plants will manage to survive their harsh childhood, now that we have an irrigation system, and we hope that our various pieces of lawn will grow. 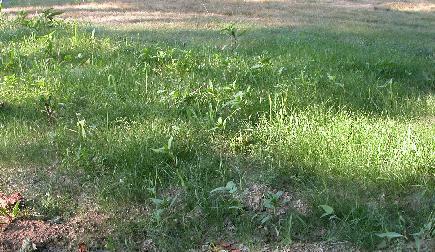 In fact, there are kind of a lot of weeds that established themselves into our original lawn before the hydroseeding, and it seems like those weeds are going to be the winners in the plant-eat-plant race. But we don't really care very much; the rest of our lawn is so full of random crap it doesn't really matter much. The wall is beautiful, if you like that kind of thing. I mostly don't; I remember going to Manhattan, and looking out over the Hudson River from the "bank" -- a stone wall. There were stone walls as far as you could see. I'm sort of sad to be part of Lake Massapoag's urbanification. But I have to admit I'm secretly kind of pleased with the fact that we now have 15 feet of pretty much usable land between the road and the lake, where before we really just had ten feet of jungle with one path that we bushwhacked for access. 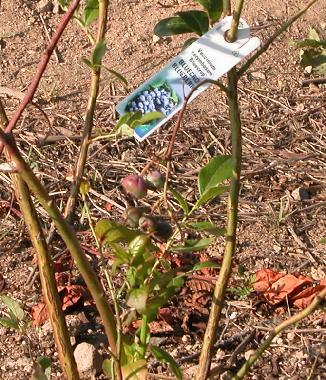 Another bonus is that blueberries are native plants, and they came with berries already on!